Balanced mutual fund is one of the most popular mutual funds for long term investor. This hybrid fund invests its assets in bond and stock. 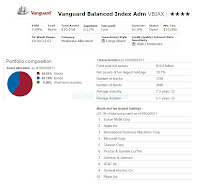 One of the top rated balanced funds is Vanguard Balanced Index Fund. More details about the fund review is described below. The investment objective of this Vanguard Balanced Index Fund is to track the performance of a broad, market-weighted bond index and a benchmark index that measures the investment return of the overall U.S. stock market. With about 60% of assets, it seeks to track the investment performance of the MSCI US Broad Market Index. The fund also seeks to track the investment performance of the Barclays Capital U.S. Aggregate Float Adjusted Index with 40% of assets. This Vanguard fund has been managed by Michael Perre since December 2000, just one month after the inception date in November 2000. This fund’s dividend yield is 2.39% and the last dividend distributed is $0.07 (in June 2011). The fund’s annual expense ratio is quite low (0.12%) compared to the average in the Moderate Allocation category (1.03%). This Moderate Allocation Balanced Fund has 4-stars rating from Morningstar. 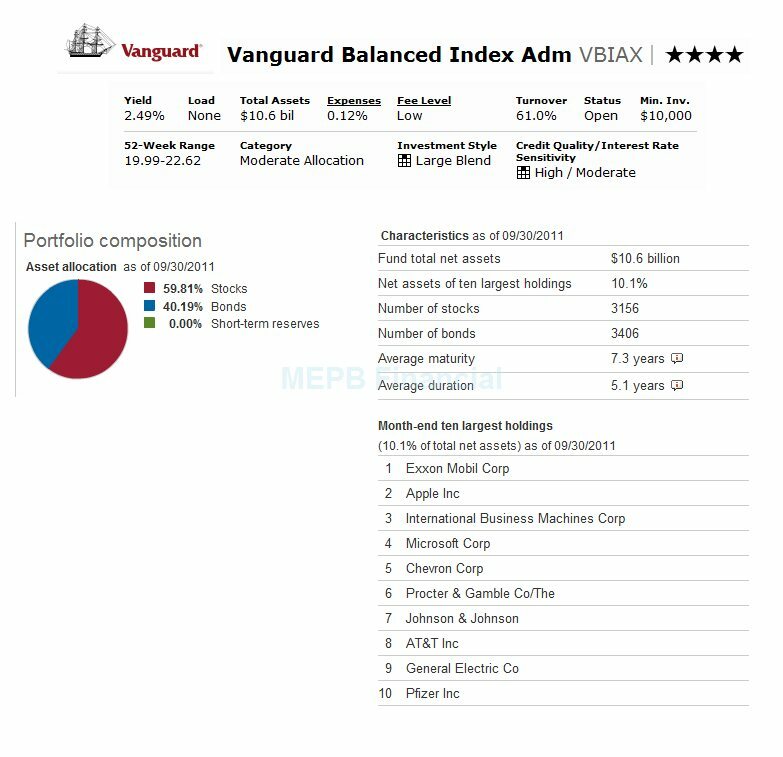 This Vanguard index fund is also awarded by S&P as its Top S&P Mutual Fund of 2011. It has achieved 7 years of positive return and 3 years of negative return. Based on the load adjusted return, this fund has returned 13.85% over the past year and 3.99% over the past 5-years. The YTD return of this best balanced fund is 1.29%. The fund’s benchmarks are Balanced Composite Index and Dow Jones U.S. Total Stock Market Index. The other class of this top rated hybrid fund is the Investor Class (VBINX). The VBINX CUSIP is 921931101. This Investor Shares fund also has 4-stars rating from Morningstar. The dividend yield is 2.34% and the expense ratio is 0.26%. To start investing in the Investor Class, the minimum initial investment is $3,000 while for the Admiral share is $10,000. As of September 30, 2011, the top 10 stock holdings of this fund are Exxon Mobil Corp, Apple Inc, IBM Corp, Microsoft Corp, Chevron Corp, Procter & Gamble Co, Johnson & Johnson, AT&T Inc, General Electric Co and Pfizer Inc. These 10 largest holdings represent 10.1% of total net assets and equals to 16.8% of equities.